Checkmarx SAST- an accurate, automated and flexible Source Code Analysis Solution. According to the 5th Annual State of Application Security Report from Arxan Technologies, 81% of respondents would change their mobile app vendor if there are security concerns. It is clear that consumers are taking security more seriously than ever, whereas the 2015 Trustwave Global Security Report showed that 95% of mobile apps tested had dangerous security issues. Static application security testing is one of the first steps to bridging this gap, and Checkmarx Security is one of the finest tools out there. Static application security testing checks the app for vulnerabilities while it is in a non-running state, by testing its source code or application binaries. Many apps have security weaknesses because of poor coding, with the use of obsolete functions or dead code a persistent problem despite increasing awareness in the industry. Static application security testing is the solution for developers. Founded in 2006, Checkmarx was built with the vision of empowering developers with comprehensive and automated security testing. It’s already risen quickly through the ranks to be one of the most trusted names in application security, with app developers everywhere using Checkmarx tools for security testing. It’s a new way of defining static application security testing. It works by providing a new platform to developers with a fast feedback system, so developers can keep doing their work and testing code fragments at the same time. Checkmarx static code analysis is built to check hundreds of code vulnerabilities, using security standards in the industry like SANA 25 to develop a detailed code security check that helps the application to be compliant with industry regulations. CxSAST supports more than twenty coding languages with no configuration required. Popular languages like Python, Ruby, and PL/SQL are naturally included but many other languages popular in the industry are built into Checkmarx Static application security testing. 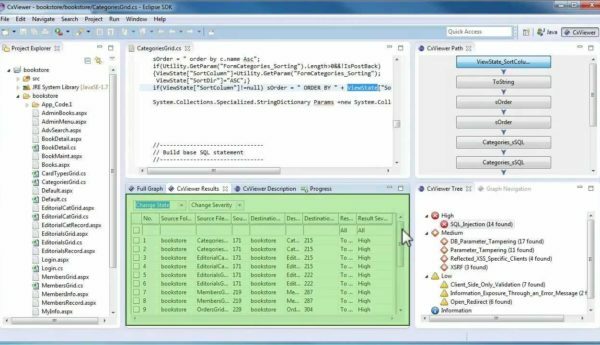 Checkmarx source code analysis tool is built as an end-user tool, and will integrate with the compiler, any other bug tracking software in play, and source repositories, as well as build management servers. Developers can use CxSAST as part of their development process, integrating it into the software development life cycle (SDLC). CxSAST is flexible, and is intended to be used as part of the development process, automatically scanning uncompiled code to identify known security vulnerabilities while the developer continues work on building the code. CxSAST is built on ‘best fix location’ algorithm which uses single point solutions to fix multiple security errors if possible. CxSAST treats developers like end-users and does not demand special training or command-line understanding to use all the features of CxSAST. Instead of waiting for the compiler to work, or using a dynamic form of security testing (which may miss out on broken code) the Checkmarx source code analysis catches weaknesses in the first step. Each weakness or security gap marked is annotated with reasoning the underlying Scan Rule. The developer can track the root cause instead of being provided with an unsubstantiated warning. Why Checkmarx Static Application Security Testing? Developers cannot afford to ignore security testing anymore, with customers more security-aware than ever and expressing willingness to move to alternatives. However, developers have good reasons for having difficulty with the traditional security testing process which involves hiring a security team, going through several days of downtime while they test the app, and perhaps having to recode a major amount after the security report. With CxSAST all that is a thing of the past. It provides a continuous feedback system that starts identifying vulnerabilities early in the development process without interfering with the developers work. You can contact eSec Forte for checkmarx pricing or cost. We are value added resller for the all the checkmarx produts. CxSAST is an entire security testing toolkit in one small suite that requires no special training to use. This inexpensive package provides immediate return on investment with developers spared the cost of hiring outside security and sitting through downtime while outsiders test the code. The Checkmarx tool for SAST is available for all major coding languages, and you can book a free demo today to see its skills. Flexibility and ease-of-use also add to the reasons that CxSAST is considered to be such a bargain amongst professional developers.